I still remember the time I was thoroughly impressed by Yggdrasil Gaming’s Incinerator slot about a year ago. Just when you think that they have reached their peak performance, they never fail to bring new ideas to the table, or in this case re-design a whole game from an existing theme ground up. This time round, Yggdrasil brand new title Power Plant is set in a futuristic space packed with heavy machinery. Don’t for a second think that Power Plant is just a re-invention of the Incinerator slot, because other than the theme, everything else is absolutely different. In fact, the bonus feature in this game is nothing like we have seen before. Power Plant sports a bonus feature within a bonus feature. Mind blowing right?! Here is something that may catch your attention no matter how long you have been playing slots for: Power Plant slots features a fixed 82 payline configuration! Achieving anything more than 30 paylines itself is quite a feat, but 82? But how?! Yggdrasil has pulled out every single bit of creative energy out of their pockets to pull this one off this time. The magic answer of how 82 paylines being possible on your reels come from the fact that the reel layout in this game isn’t anywhere near conventional layouts. Power Plant mobile slot sports a 5 X 8 reel layout. The results of this colossal amount of paylines is quite obvious – super frequent payouts. On average you would win something every three spins. Given this information, I think it is safe to say that this is a low to medium variance game as it would be extremely easy for players to maintain their bank balance throughout the entire gaming session. For those of you who are more technical the Return to player (RTP) rates of this slot game is 96.1%. The RTP here is somewhat average, but given that this game is all about the Wilds, the RTP isn’t really a true representation of what your wins are going to look like in real life. Yggdrasil has also set a pretty wide wagering range as Power Plant slot accepts anything between 25p to £250 per spin. In my humble opinion this game will suit enthusiast’s more than casual players due to its feature design. Power Plant mobile slot features only one feature (or maybe two since there is a feature within a feature, but more on that later) and it’s mainly driven by Wilds. How Does This Mobile Slot Perform? I will admit that at first I felt a little bit weird playing on this reel layout but it did grow on me over time. Coupled with the fact that this game pays out super frequently, the distraction that your wins create will be good enough to get you used to the unconventional reel layout. Reels aside, all the graphics elements in this game has been beautifully designed. The symbols are well distinguished from each other creating an illusion of powerful machinery and mechanical parts working hand in hand together to pay you frequently. Sound effects have also been tailor made to suit the theme very well. If you closed your eyes and only listened to the sound effects, you would probably think that you were stuck in a nuclear reactor or some sort. Gameplay wise, all aspects of Power Plant mobile slot is as smooth as you can ask it to be, and this game is compatible on all mobile devices and on PC. Also, if you are like me and stuck with an ageing phone, in my case a three year old Samsung S4, worry not, you will not notice any difference in terms of gameplay. Frames per second might drop a teeny bit, but unless you look really close, you will not be able to notice it. So, now that we have established that Power Plant slot has an unbelievably high amounts of paylines, there is only one way to take advantage of it. WILDS! This whole game is about the Wilds. There are four different features in this game and they all depend on how many wild stacks that you get on your reels. This feature itself is called the Feature Respin and to activate this, you are required to obtain at least one full stack in the main game. 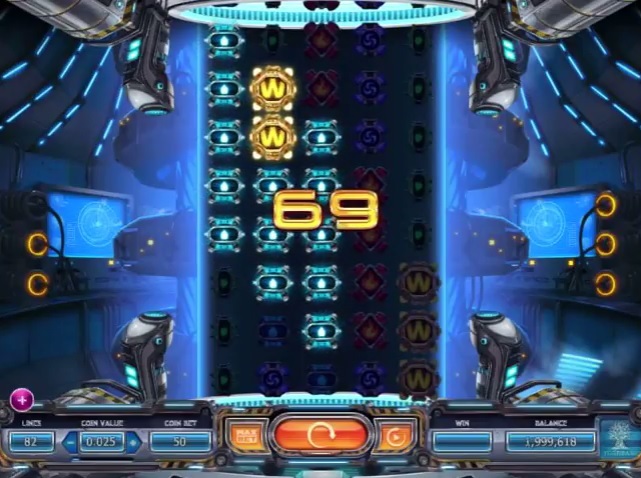 Different number of stacks will result in respins with different characteristics and win features. This feature system in place in this slot is a little bit complicated (I had to play it myself a couple of times before understanding it completely), but put it this way. The special feature are a part of the first feature and can only be played when the Feature Respin is active. It is literally a feature within a feature. There is only one slot developer that could come up with something as mind boggling as this and it is Yggdrasil Gaming. Without a single doubt, the unique feature in this game is its reel layout. It’s not just the fact that its unconventional that makes it unique, but how it drives more paylines and more payouts to players that makes it impressive. Another notable feat of the Power Plant slot is how Yggdrasil Gaming has successfully made every aspect work hand in hand to deliver the best experience to the player. 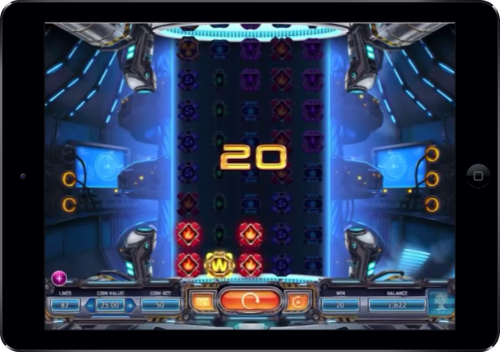 The theme, the gameplay and all the way to the audio visuals adhere to the same theme producing high quality gameplay throughout. This is something that I feel that other developers struggle to archive. More often than not, when you play sub par games, you will feel as if the developers just threw in a bunch of features together and hoped players would like it. Want to play Power Plant? Power Plant mobile slot is an absolute thrill to play. With its unique reel layout and 82 paylines, you are up for a Wild time! Summary Power Plant mobile slot is definitely fun to play. Right from the bat it will capture your attention with a slightly unconventional reel layout and subsequently keep your attention with hyper frequent payouts. Granted the payouts are generally small to medium in amounts, but you will always be able to maintain your bank balance on top of minimising your risks. All you have to do is trigger a few bonus features and you will be able to cash out handsomely. Daisy doesn't like to be restrained to just one topic here at MobileSlots4U, so you'll see her writing about a variety of different subjects. However, the one common theme throughout her posts is that she loves anything new and modern. Be it new slot games, new depositing methods, new promos or casinos, if you want keep up with the fast-paced world of iGaming then Daisy's your girl. With a Philosophy background, you can expect debate, analysis and clarity in everything she writes.